New England Patriots head coach Bill Belichick. Philadelphia Eagles head coach Doug Pederson knows what he's up against. In just his second head season as coach, he'll be going up against a coach-quarterback duo that's been winning rings for longer than he's been coaching. When Tom Brady and Bill Belichick won their first Super Bowl in New England, Pederson was still backing up Brett Favre in Green Bay. The Patriots would win two more Super Bowls (in 2003 and 2004) before Pederson retired following the 2004 season and took a job coaching high school football in Shreveport, La. As Pederson climbed the coaching ranks, the Pats won another in 2014. And in his first season as a head coach, New England won its fifth title of the Brady/Belichick Era. No, in his first trip to the playoffs, Pederson will have a chance to dethrone not only the reigning the champs, but also the team that has been the gold standard in the NFL for over a decade and a half, winning eight conference championships since 2001. So how does Pederson plan to keep his players from getting blinded by all that hardware? "I think that's obviously a real question, a real issue that you have," Pederson said Thursday. "These guys have been there, they've done it, they've proven it time and time again. My biggest focus with the team has just been let's just focus on today; let's win today; let's get better today and we'll worry about that when we get to the game. "Obviously, it's a credit to what the Patriots have done in their careers, in their history, and everybody is trying to win championships like that, but we've just got to focus on today." That being said, the Patriots' rings haven't come without a bit of controversy – like SpyGate, which many still believe contributed to the Eagles losing the 2005 Super Bowl, and DeflateGate, both of which were serious enough that the league took punitive action against the organization and those involved, namely Brady and Belichick. Even this year, internet conspiracy theorists began blaming the Patriots for fog that blanketed their stadium during a rematch of last year's Super Bowl against the Falcons. That may sound ridiculous – probably because it is – but it likely wouldn't have even been considered if the team had a clean record when it came to these types of things. "Really? Now they can control the weather?" Pederson responded when asked if he's worried the Patriots may try something illegal. "Well, we're playing in a dome, so there won't be any fog – unless the lights go out again. Listen, I don't really – my mind doesn't really go there. 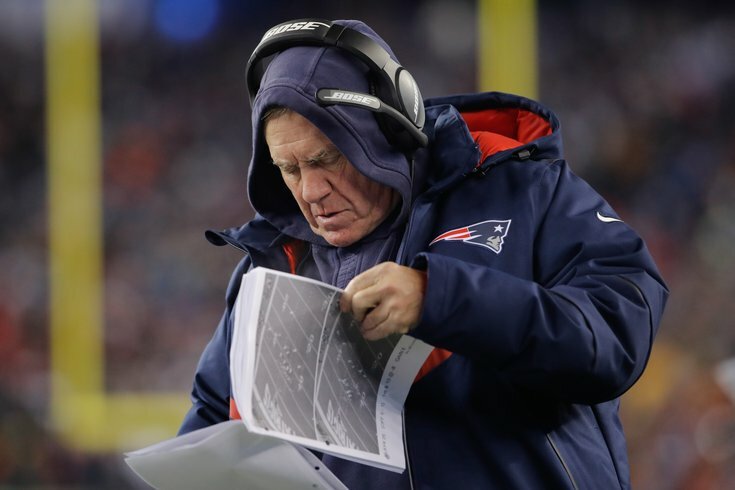 I'm focused on the Patriots and [their] scheme and trying to figure out how to beat them. That's the bottom line, how to get my team ready to play the final game of the season, and that's where my mind is right now." So what has stood out to Pederson about the Patriots during his film sessions so far this week? "They're a resilient group too. Just put on that Jacksonville game. Here's a team that gets down in a game early and there's no panic. They just stay the course, execute their gameplan. The defense is creating turnovers, they're getting three and outs, getting the ball back for their offense. And that's what they're doing; it's just an efficient group. "That's why it's important for us to make sure that we continue to detail what we do in practice, execute our gameplan. Guys are focused that way and not getting caught up with what they do. It's about what we do." In a few days, the Eagles will board a flight to Minneapolis. If all goes well, they'll return to Philadelphia with the first Super Bowl title in its history – assuming there's anything left of this place when they land. In the meantime, however, Pederson plans to keep his players and the rest of his coaching staff plenty busy. "Listen, we've got a game to play. It's not a vacation next week," Pederson said, adding that after a long week this week, he plans to "grind the midnight oil" again once they arrive in Minnesota. "My message to the team has been just that. We're going to prepare this week as if we're playing this weekend and then we can sort of fine-tune some things. "We've got to stay on top of our game; we've got to keep the grind, keep the intensity going right into next week."